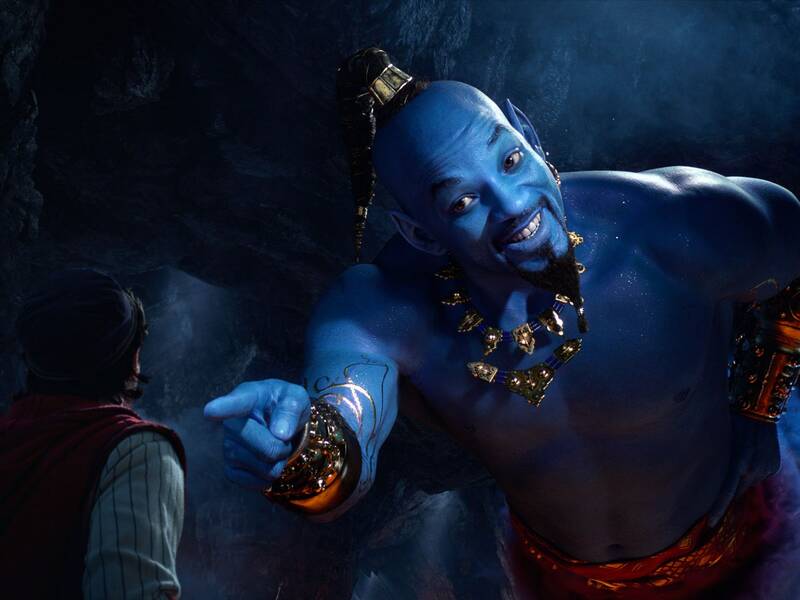 Last night, fans got their first look at Will Smith’s Aladdin Genie in all of his very blue glory. Last night, amidst the hubbub of the Grammys, Disney released the first TV spot for its upcoming live-action version of Aladdin. Directed by Guy Ritchie, it features Hot Jafar, a sweeping soundtrack, and Will Smith as the iconic Genie (the character voiced by Robin Williams in the animated 1992 film). The trailer itself looked fine; Smith’s Genie, however, looked, well, off. It’s hard to place exactly where in the Uncanny Valley this particular image lives, but given Smith’s blue hue, it’s definitely wading into Smurf territory. But in a way, this reaction definitely falls into the category of Be Careful What You Wish For. When Entertainment Weekly put the movie on its cover, fans responded harshly to the fact that Smith wasn’t blue. When the actor posted the trailer on his Instagram, he captioned it with “I told y’all I was gon’ be Blue!! … Y’all need to trust me more often!” Yes, folks should always trust Will Smith. Should they trust CGI? Eh, that’s a different story. But hey, maybe this look isn’t final. Maybe by the time Disney releases the film on May 24 the blue will be better. Or maybe everyone’s collective eyes will adjust? Time will tell. Until then, Twitter will be busy turning images of Smith’s Genie into everything from Jack Nicholson’s character from The Shining to remixes of the Star Is Born meme from last year. Also currently taking off on Twitter: Comparisons to Tobias Fünke’s “I blue myself” bit from Arrested Development and Violet’s transformation into a blueberry from Willy Wonka and the Chocolate Factory. So let’s enjoy the memes—shining, shimmering, splendid. Next PostNext Could my trip to Trieste be hit by… you know what?